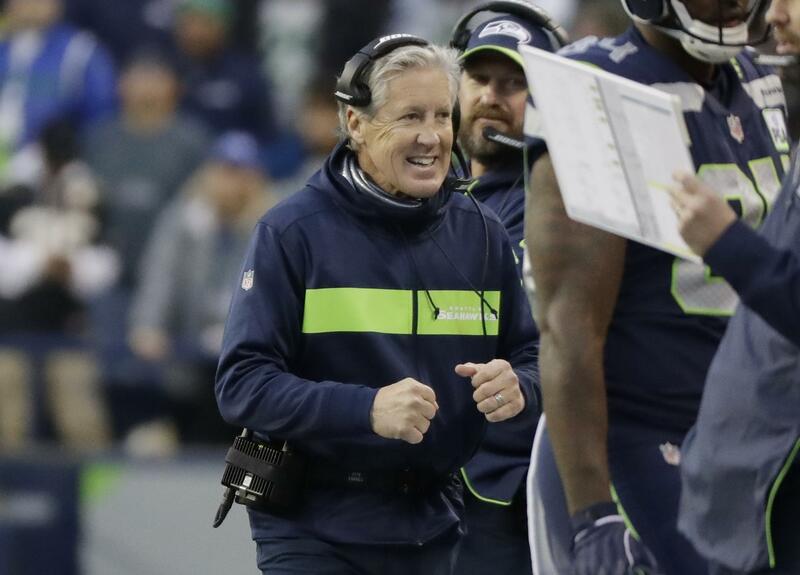 UPDATED: Wed., Dec. 5, 2018, 11:54 p.m.
RENTON, Wash. – After four consecutive weeks of playing tight, one-score games decided in the fourth quarter, Pete Carroll enjoyed spending a Monday reviewing a rare comfortable victory. Seattle’s blowout win over San Francisco on Sunday only strengthened what is becoming another late playoff push by the Seahawks, and after a day in which they got results that helped in trying to get back to the playoffs after missing last season. Seattle is in command of one of the wild-card spots in the NFC and its hopes were strengthened by Carolina and Minnesota suffering losses. Seattle holds the tiebreaker over Carolina and can have that in place over Minnesota with a win at home Monday night against the Vikings. Seattle’s roll is reviving memories of 2015, when it was 4-5 after nine games. But this time, success is coming a different way. That season, the Seahawks leaned on the passing arm of quarterback Russell Wilson as he threw for 24 touchdowns and one interception over the final seven games as Seattle went 6-1 down the stretch and made the postseason. Wilson averaged 272 yards passing and 31 pass attempts per game during that stretch. So far, it’s been balance and efficiency that’s defined Seattle’s offensive performance during its three-game win streak, although his overall numbers aren’t that dissimilar. Wilson has eight touchdown passes and no interceptions during the stretch, averaging about 250 yards passing. But there’s been no fall-off with Seattle’s run game, meaning Wilson isn’t being forced to carry the offense. In Sunday’s 43-16 win over San Francisco, Wilson attempted six passes in the first half. He threw for touchdowns on three of them. Seattle will take that kind of efficiency – even with reduced numbers – all the time. Seattle came out of the win over the 49ers with one major injury concern after guard D.J. Fluker suffered a hamstring strain. Carroll said Fluker had a “grade 1” strain and would likely miss a couple of weeks. When Fluker was unable play last month against the Rams, Jordan Simmons stepped in to start. Published: Dec. 5, 2018, 2:53 p.m. Updated: Dec. 5, 2018, 11:54 p.m.